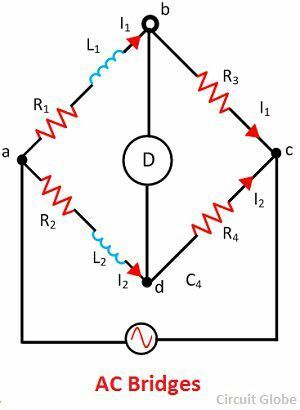 Definition: The bridge uses for measuring the value of unknown resistance, inductance and capacitance, is known as the AC Bridge. The AC bridges are very convenient and give the accurate result of the measurement. The construction of the bridges is very simple. The bridge has four arms, one AC supply source and the balance detector. It works on the principle that the balance ratio of the impedances will give the balance condition to the circuit which is determined by the null detector. The bridges have four arms, two have non-inductive resistance and the other two have inductances with negligible resistance. The l1 and R1 are the unknown quantities which are measured in terms of R2, R3, R4 and L2. From equation (1) and (2) the following points are concluded. The two balance equation is always obtained from the AC bridges. The unknown quantities are determined through the balanced equations. The unknown quantities are usually inductance, capacitance and resistance. The balance equations are independent of frequency. The ac bridges are also used in other applications likes in the communication system, in complex electronics circuit etc.